A good cup of joe in the morning can set the mood for your whole day if you are a coffee person. While some of you may be tempted to rely on a barista to serve your daily cup, that can get a bit pricy and well, impractical. It’s not just this “keeps you awake” thing that makes coffee so great. Coffee isn’t just warm and energizing, it has a lot of health benefits. 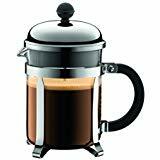 To enjoy a good cup of coffee the practical and cost effective way, you will need a good coffee maker. 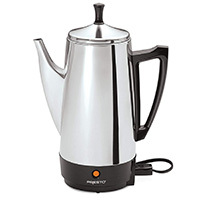 To that end, we recommend the Presto 02811 12 Cup Stainless Steel Coffee Maker. You want to know why this is the best stainless steel coffee maker? Continue reading this review. Even though it isn’t quite as big, the Presto 02811 packs a lot of brewing power. Unlike traditional coffee makers which require one to introduce their own heat source, this coffee maker can easily make 12 incredibly rich cups of coffee within a short amount of time (around 12 minutes give or take). This makes the Presto 02811’s coffee brewing performance better compared to other drip coffee makers that are available on the market today. Its brewing process will ensure that the end result is a fresh, fragrant and full-bodied cup of joe. Once the water at the bottom of the coffee maker begins to boil, it is shot up through the perk tube. Then, it seeps in the coffee grinds slowly. This is what ensures that you obtain the freshest cup of coffee every morning (or evening, whichever time you want). When it comes to design, this is how a coffee maker is really meant to look like. The Presto 02811 has a throwback aesthetic to it that will certainly get a couple of conversations started. It has a brushed stainless steel exterior that adds to its retro design. The shape of the lid gives you fond memories of your sweet grandma. Plus, it’s decently sized too. With dimensions of 13.1 x 9.7 x 6.2 inches, it will fit well into any countertop. Best of all, the Presto 02811 is lighter. It only weighs about 3.8 pounds. At first glance, it will really look sturdily built and contains almost no plastic in its construction. The engineers who designed this coffee maker also seemed to have listened to the desperate cries of coffee lovers all over the world. That’s because they made the power cord removable. That way, you can serve coffee in the other room a lot easier. Aside from that, it is very convenient to store. Compared to other coffee makers in the market today, the Presto 02811 12 Cup comes equipped with a warmer which works very efficiently to keep what you’re brewing hot. Once the coffee maker brewing process is completed, its light indicator will turn on and the coffee maker’s warmer will automatically turn on too. This feature ensures that each cup of coffee you will serve is perfectly hot coffee. Plus, it also has a heating mechanism that works to ensure that your coffee doesn’t go cold and stale rapidly. 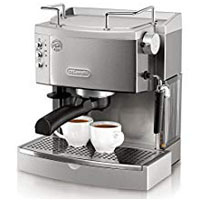 This quality Presto stainless steel coffee maker is designed and built to provide many years of satisfactory performance under normal household use. Presto pledges to the original owner that should there be any defects in material or workmanship during the first year after purchase, they will repair or replace it at our option. Their pledge does not apply to damage caused by shipping. Aside from that, outside the United States, this limited warranty does not apply. The Presto 02811 12 Cup Stainless Steel Coffee Maker is the perfect fit for any coffee loving household. It does what it is supposed to do. It’s very durable and stylish too. The stainless steel construction adds to the charm of this coffee maker. Even though it isn’t quite big for its size, it can produce a decent amount of coffee (12 cups to be exact). Plus the brewing time is pretty good. 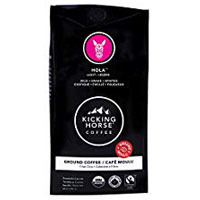 Best of all, it keeps your coffee hot and rich in flavor for a long time. Just what you need from the best stainless steel coffee maker.